Last year rookie sensation Brandon Jennings helped spark the Bucks to their most successful regular-season campaign since 2000-01. 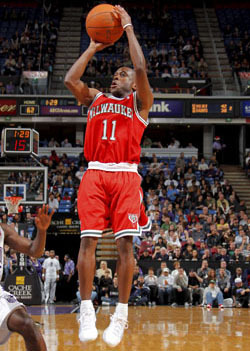 Everyone expected Milwaukee to continue to rise up the ranks and emerge as one of the better teams in East this year. But the vast improvement of conference rivals New York and Chicago coupled with the recent loss of their starting point guard to a broken foot are making post-season contention a serious challenge. 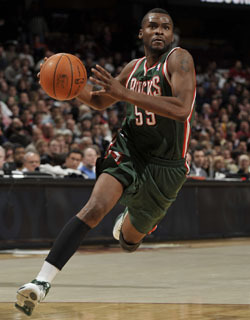 In Jennings’ absence, veteran guards Keyon Dooling and Earl Boykins are stepping up to help Milwaukee stay in the playoff picture until Jennings returns to health. Both players have been in the league for over a decade and have played for a number of teams, contributing successfully when called upon. Combo guard Dooling started the past three games and averaged over 11 points and 5 assists last week, while Boykins contributed 22 points and 19 points off the bench to the Bucks’ big road wins over the Lakers and the Kings. A team-oriented type of guy, Dooling has the ability to make 3-point shots, and he has been a hardnosed defender throughout his career. Although he is the shortest player in the NBA, Boykins is extremely strong and keeps himself in great condition. He has always been a scorer, and when Boykins gets on a roll he’s dangerous. The Bucks play three games this week beginning with tonight’s home game against the Hawks. Both Keyon Dooling and Earl Boykins are available in most leagues and will be playing starter minutes so take your pick.